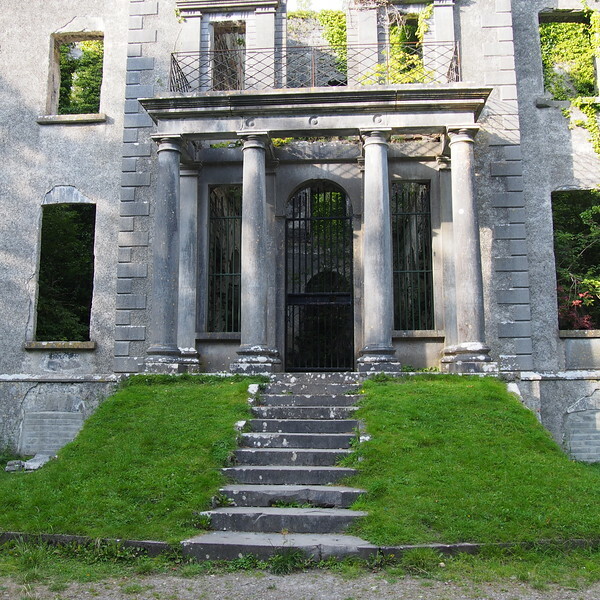 Ireland has many beautiful ruins tucked away in the countryside. Many of these were country houses of the English that were burned during the Irish Revolution of 1919-23. A total of 275 “big houses” were destroyed between 1920 and 1923. The ruins of Moore Hall stand near the shore of Lough Carra in County Mayo, Ireland. The grounds and exterior of the house are open to the public but the gutted interior is locked behind iron gates for safety reasons. There is little left of the interior anyway. Some sources say that George Moore was warned that the area around Muckloon Hill was unlucky. 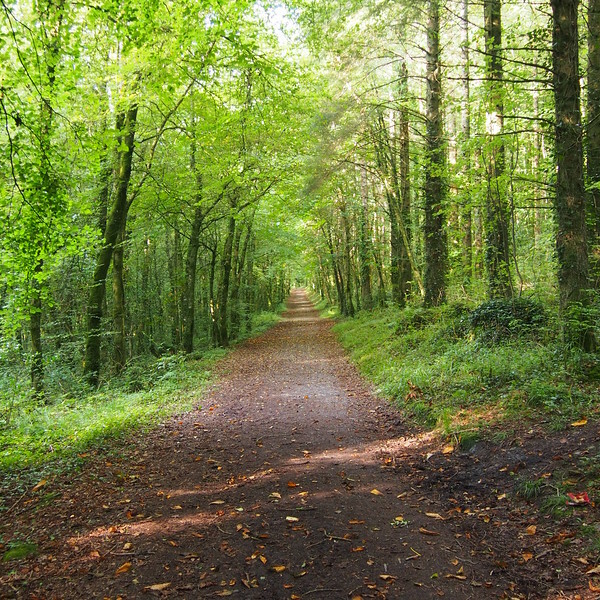 Local legend has it that King of Connaught’s druid, Drithliu, was killed near here in 400 AD. Whether George really knew about this legend is unclear but he decided that the hill with its view of Lough Carra was the perfect spot to build his estate. The architect John Roberts designed the house and construction was started in 1792 and completed in 1795. The house would have originally had three floors and a raised basement. The house had 30 rooms (7 main bedrooms). In 1809, the library contained 2,000 volumes. The house as it looked in the early 1900s. Photo by Robert French. Reproduction rights owned by National Library of Ireland. Forest path leading to the house. If you are driving from the Castlebar direction, you will first pass the main gate of Moore Hall. This is locked. Continue driving toward Lough Carra and you will find a car park. It is a short and pleasant walk to the house from here. The inscription near the roof is almost impossible to read now but it is Fortis cadere cedere non potest, which translates to something like “A brave man may fall but cannot yield”. Main entry to Moore Hall. An iron gate blocks the doorway. Looking through the gate, you can see that little is left of the interior. Tunnel at the back of the house. 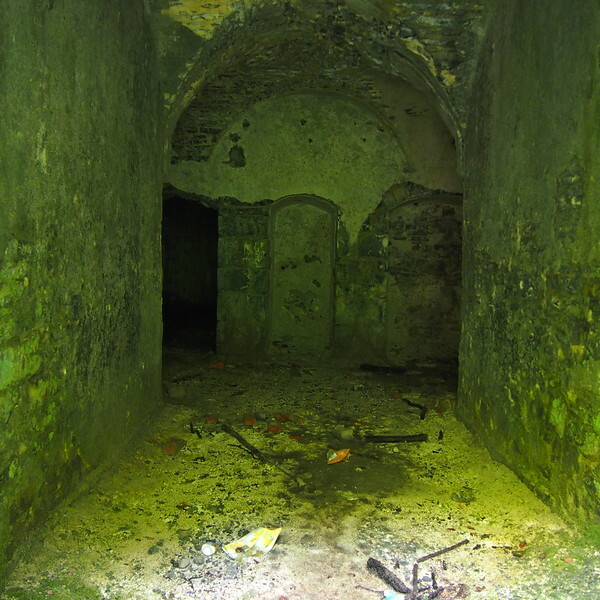 In the middle of the tunnel pictured above, is a doorway leading to a back courtyard of the house. 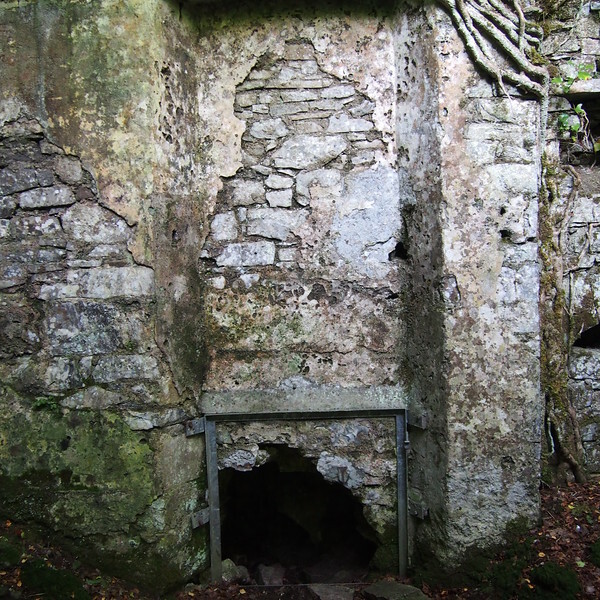 This was the servant’s entrance. 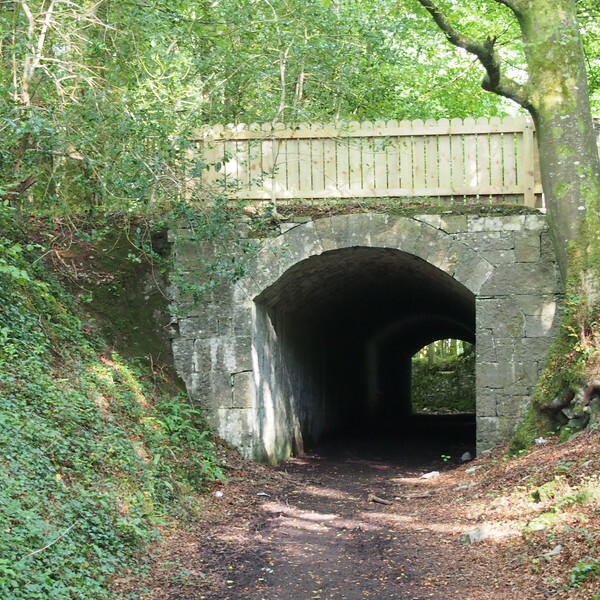 I have read that the short tunnel itself was created to allow horses to be brought from the stable to the gallops (the training grounds/track) without destroying the back lawn. The tunnel and courtyard can be very muddy so wear old shoes if you want to go inside. 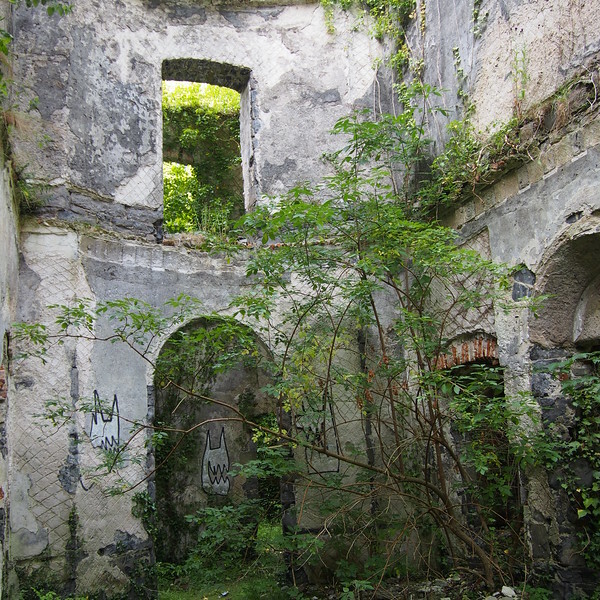 Overgrown courtyard in the back of the house. This courtyard would have housed the turf shed and there is a brew house marked on the plans I saw as well. There are two other doors back here, locked with iron gates. The photo below shows as much as I could see with the flash of my camera. Servant’s entrance to Moore House. The doorway in the photo above would have led to the servant’s quarters and kitchen. Small doorway/storage area behind kitchens. If you are looking at the back of the house, in the far right corner there is a small opening in the wall. I am not certain what this was and I did not have a light with me to be able to look inside. On the plans for the building, this area is the scullery next to the kitchen. It is likely that this small opening led to some kind of food storage room. Crawl inside if you want but keep in mind that Ireland is home to some surprisingly large spiders and the basement of Moore Hall is now the home of a colony of Lesser Horsehoe bats, a protected species. 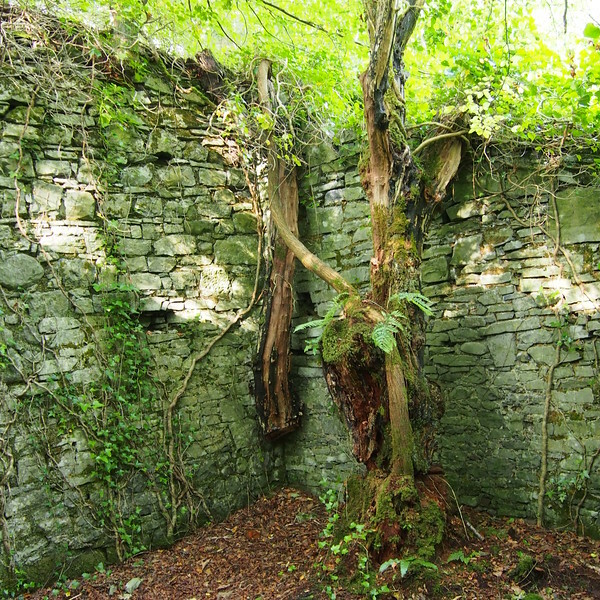 There are extensive grounds, including a couple of ruined outbuildings and a large overgrown garden. There was some talk back in 2006 about restoring more of the grounds but it came to nothing and there is no money in Ireland to do such a thing at the moment. The map showed a ráth (ringfort) farther down the path but the sun was setting and we decided to head home. By most accounts, the burning of Moore Hall was senseless, vengeful destruction. The Moore family had also treated their tenants well unlike many of the old landlords in Ireland. In his book Remembering the Year of the French: Irish Folk History and Social Memory, Guy Beiner gives the following explanation for the destruction. This is an example of one the best stately homes in the west of Ireland. It’s such a pity that it wasn’t restored to it’s former glory. As you say there was talk in 2006 of restoring the house, but that came to a haul with the collapse of the Irish economy. 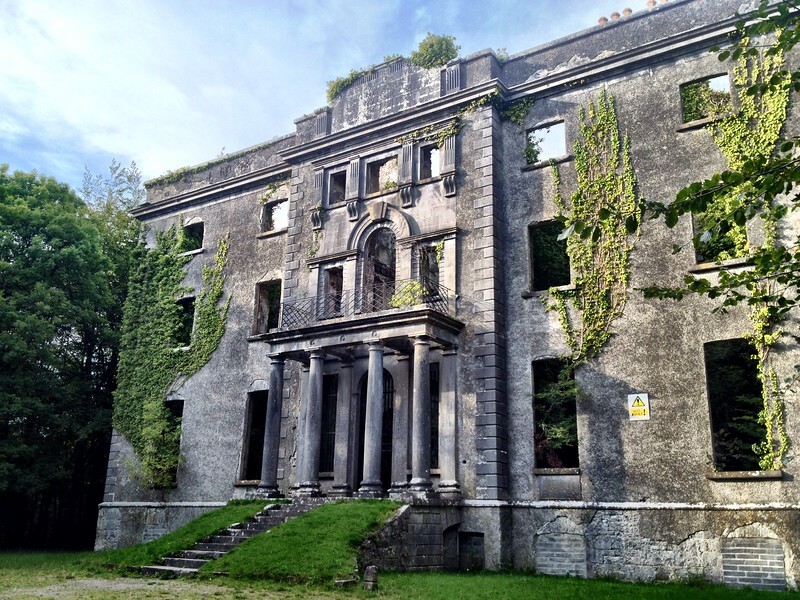 With economy on the way up again, lets hope Moore Hall can be restored and hopefully opened to the public.